Ever since his early days on the police force in Chesapeake, Va., Kelvin Wright has been intrigued by the idea of using cameras to fight crime. As a traffic officer in the late 1980s, he was the first cop in the department to test them on car dashboards. Chesapeake police then experimented with body-worn cameras as long ago as the late 1990s, but the technology proved impractical. By 2009, Wright was the chief. He decided to equip 90 of Chesapeake’s officers with newer-model body cameras. At the time, such recording devices were in use only in a select handful of police departments around the country. That is quickly changing. Sparked mostly by the riots following police killings last year in Ferguson, Mo., and Staten Island, N.Y. -- and, more recently, by the shooting death of an unarmed black man in North Charleston, S.C. -- there’s been a national surge of interest in outfitting officers with body-worn cameras. 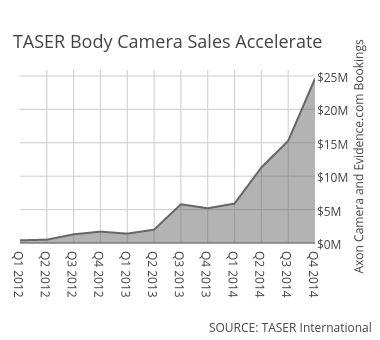 Just two years ago, TASER International, a leading vendor of the devices, only supplied cameras to Chesapeake and a few hundred other agencies. Now the company reports more than 2,500 law enforcement agencies use more than 30,000 of its cameras nationwide. One national expert recently told The Wall Street Journal he estimates that 4,000 to 6,000 police departments, out of about 18,000 nationwide, use body cameras. No state mandates body-worn devices yet, but according to the National Conference of State Legislatures, lawmakers in 29 states had introduced various body camera bills as of March. An early proponent of body cameras, Chief Kelvin Wright expects they will one day be standard issue for officers everywhere. Departments with body cameras are finding that there’s much more to it than merely strapping a camera on an officer’s uniform. Managing all the hours of video footage comes at a price, both in labor and data storage costs. Perhaps even more significant, body-worn cameras come with numerous unintended consequences, some of which will get worse as the technology becomes widespread. By now, Chesapeake police officers have grown accustomed to being recorded. They begin their shifts by picking up a camera from docking stations, and they end their shifts by plugging the devices back in. All of the recorded video and audio is automatically uploaded to Evidence.com, an internal website that’s sort of a YouTube for Chesapeake police. Officers can review footage at computer terminals while writing up reports, or watch clips right away using an app on their smartphones. Traffic officers already familiar with the benefits of in-car cameras, Wright says, played a role in securing buy-in as the department implemented body-worn devices across other units in recent years. The department also publishes regular reports tallying the number of complaints against officers that are invalidated by body camera footage, providing a clear incentive for officers uncomfortable with being recorded on the job. All uniformed Chesapeake police officers -- about 250 total -- are required to record every encounter with citizens when performing law enforcement-related duties or responding to calls for service. The hours of footage quickly add up. Only six months after expanding the program, Chesapeake police had exceeded their initial data storage capacity that was expected to last at least a year. It’s the expense related to data storage -- not the purchase of the cameras -- that typically ends up being most costly for departments. Police agencies are also learning that processing video footage is labor-intensive. Chesapeake officers tag videos as evidence and may spend extra time when writing reports to ensure they’re in sync with what recordings show. Police department staff respond to requests for footage, occasionally needing to redact portions of clips. Last year, police responded to more than 1,500 requests from the Commonwealth’s Attorney’s Office alone, most of which required the production of two or three videos each. The workload was so heavy that the department created a new position of video evidence coordinator to handle all the requests. The video footage means more work for attorneys as well. Reviewing video of a typical traffic stop takes at least a half hour, and multiple videos exist when more than one officer arrives on the scene. “When they started coming in here,” says Chesapeake Commonwealth’s Attorney Nancy Parr, “it took everybody by surprise how time-consuming it was to watch the videos.” Periodic beeps can be heard throughout the day in Parr’s office from recorded noises the cameras make as videos are played. Many of the Commonwealth staff attorneys end up watching the videos in the early evening hours and on weekends. Before the cameras are even put in place, an array of policy issues must be discussed among police, attorneys and city officials. Someone must decide which types of interactions will be recorded, how long video will be retained and what footage can be released to the public. States haven’t addressed many of these issues yet, so local departments are left to outline policies in consultation with city legal advisers. The result has been a range of different policies. Chesapeake, for example, does not require officers to notify citizens that they’re being recorded, and the city stores video not tagged as evidence for 13 months. Officers in neighboring Norfolk notify the public when they’re being recorded and retain video only 45 days if it’s not used for evidence. Before cameras can be put in place, police, attorneys and local officials need to decide which types of interactions will be recorded, how long video will be retained and what footage can be released to the public. Local elected officials in some jurisdictions have attempted to force departments to adopt the technology more quickly than they would prefer. In Baltimore, city council members passed a bill last year requiring police to wear cameras. Mayor Stephanie Rawlings-Blake vetoed the measure, arguing that the council’s powers should not extend into police department operations and that the bill failed to adequately address legal and privacy issues. The program “must be done right and should not be something that is hastily implemented without measures in place to ensure its success,” the mayor wrote. Rawlings-Blake, who supports adoption of the cameras, instead formed a city task force that later recommended a pilot program. Then there is the issue of taping citizens in private residences. Darrel Stephens, executive director of the Major Cities Chiefs Association, says some people may hesitate to call police to their homes in select circumstances, such as domestic disputes, if they believe the recordings could be opened to public consumption. “There are lots of situations police get engaged in that don’t seem appropriate to allow people to look at on YouTube,” Stephens says. Chesapeake’s policy requires officers to turn off cameras inside medical facilities or when they’re appearing before a magistrate. In Florida, all body camera video, with a few exceptions, is subject to public records requests. One state Senate bill attempts to scale back the state’s broad public records law, exempting footage shot inside private residences, schools or hospitals. Early evidence suggests that, unintended consequences notwithstanding, the cameras yield significant benefits. A 2012 study of the Rialto, Calif., Police Department found a significant reduction in use-of-force incidents among officers randomly assigned to wear cameras, along with an 88 percent year-over-year decline in citizen complaints. A study examining a Mesa, Ariz., Police Department pilot program showed similar results over an eight-month period, with officers not wearing cameras recording nearly three times as many complaints as those who wore cameras. Many complaints against Chesapeake officers with camera footage are cleared immediately, not requiring further investigation. The department investigated 36 complaints last year, compared to more than 60 per year in 2010 and 2011, when the program had not been fully implemented. Chesapeake reports that the cameras have proved particularly useful in DUI cases. Defense attorneys find many clients’ accounts of their arrests don’t match the videos. Chesapeake prosecutor Parr says she suspects the videos have led to more guilty pleas for DUI charges, although no exact figures are available. Body cameras can also play a pivotal role in quelling highly charged situations, as was the case early one morning in 2013 in Daytona Beach, Fla. There, two city police officers shot a well-known former high school and college football star while responding to a domestic dispute. The shooting prompted immediate outrage from residents of the low-income community. Body camera footage, however, showed the man holding a butcher knife to his girlfriend and refusing officers’ calls to release her as he appeared to start pushing the knife into her chest. To help mitigate any backlash against police, Chief Michael Chitwood reviewed the footage and invited neighborhood leaders and the news media to watch the video later that day. “What could have been a potentially serious problem was abated because of the body cameras,” Chitwood says. The State Attorney’s Office later cleared the officers of any wrongdoing. Every officer's camera has an assigned docking station. So far, body cameras have generally enjoyed strong public support. Police unions have pushed back, but their concerns are focused more on specific policies than on opposing the cameras outright. Officers, for example, want to ensure they’re still able to carry out private conversations, interview confidential informants and use the restroom without being recorded. The top concern among law enforcement officials is that they’ll be stuck with an unfunded mandate, says Virginia state Sen. Donald McEachin, who introduced a bill requiring all departments to begin deploying body cameras by 2018. Departments in Norfolk and other places have used federal asset forfeiture funds to purchase cameras. The White House has also proposed $75 million in matching funds for states and localities to pay for equipment and storage. Any one-time grants, though, fail to cover data storage and other camera-related costs over the long term. Chesapeake pays roughly $1,800 per camera, which includes mounting equipment, licensing fees and maintenance plans over five years. Annual data storage for the entire department currently costs about $24,000. Expenses are exponentially higher for big-city police departments. Officials in Charlotte, N.C., recently approved spending $7 million over a five-year period to purchase and operate 1,400 police body cameras. As more agencies line up to the buy the cameras, the increased demand may not only help push down costs, but also accelerate the pace of technological innovation. The latest body cameras on city streets today pale in comparison to what’s possible in the years to come, says the Police Foundation’s Bueermann, who envisions devices activated automatically when a cop removes a gun from a holster or when certain keywords are uttered. In addition, voice recognition and facial identification capabilities may eventually make their way into the devices.